Acne and can scars affect nearly 50% of adult women and over 25% of adult men. Acne can appear at just about any age (overall 75% of all people suffer from acne breakouts at some point of their lives) and afflicts all ethnic backgrounds making it one of the most widespread medical conditions in the world... As acne usually makes its first appearance when we reach puberty the incidents of adult acne is steady increasing and the reason behind both- adolescent and adult acne is mostly the same: hormones. When the balance between testosterone and estrogen is broken and more testosterone breaks down into a substance called dihydrotestosterone, which over-stimulates the sebaceous gland to start producing more sebum, it causes subclinical inflammation that is the initiating factor in clogging the pores which results in the formation of an acne lesion. When our blood sugar and insulin levels rise, whether from a poor diet or from stress, we experience a serious increase in inflammatory chemicals at a cellular level. This causes inflammatory diseases such as acne to worsen dramatically. Stress and hormonal changes also contribute to acne. Cortisol and other adrenal steroids can act as androgens (male hormones) and stimulate the sebaceous (oil) glands resulting in a flare-up of acne. We know that acne forms when oily secretions from the sebaceous glands beneath the skin plug up the pores. But what causes the oil to form in the first place? High levels of the neuropeptide Substance P plays a role in increasing the size and activity of the oil producing gland. In addition, another hormone, the stress hormone called corticotropin-releasing hormone (CRH) is released in the sebaceous gland - also contributing to the production of excess oil, which sets the stage for acne. 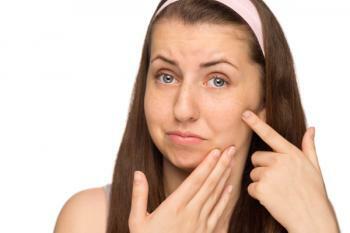 The wrong foods also start this chain of events resulting in acne. When we follow the anti-inflammatory diet, we will see acne dramatically decrease in a matter of days. It is also vital that we find ways to eliminate physical, mental and psychic stress—a huge cause of acne. If you have ever had an acne flare-up before an important event, it is not a coincidence. The stress you were experiencing is directly correlated to the breakouts. A blemish begins approximately 2-3 weeks before it appears on your skin's surface. The sequence of events leading to the appearance of a pimple or cyst actually takes this long to develop before the blemish is evident on the surface of the skin. It is therefore imperative that you select the treatment that not only helps with present breakout but also prevents new breakouts. AcnEase is such a therapy. It actually stops an inflammation cascade so you do not only see the exiting pimples disappearing but also a reduction in new breakouts. Since AcnEase does not directly affects your hormones and has no adverse effects many of its users continue using AcnEase even when symptoms totally disappear to prevent them from returning and to further protect the skin against acne scars. .
Limit intake of coffee and tea. Replace them with water and herbal teas (no caffeine). It is a well - established fact that people who do this have significantly lower cortisol (a major stress hormone) levels.